Introducing the "Michele" Scarf....Add a touch of class and elegance to your outfit. This will be the only accessory you will need to highlight a solid colored outfit....Made of a luxurious chiffon fabric, it has a "soft to the touch" feel. Choose between 2 sizes, 10 in. X 45 in. or 16 in. X 72 in. Exude Loveliness in the Leina'ala Dress. This "off the shoulder" style is versatile and can be worn several different ways. Made out of a heavy gauge chiffon fabric and easy to care for. Available in sizes XS - 3X. Slip into this comfortable A Line Trapeze Dress and go with the flow! The Misty Dress is loose and flowy and has a silky feel. Made of a Poly/ Elastane blend lightweight fabric. Manufactured in the USA, turnaround time is approximately 2 weeks! Available in sizes XS - 2X. Standard American sizing. The Kalena Dress has a soft, velvety feel. Made of a light velour fabric, great for office attire or nice dinner attire. It has flowy sleeves, a waist belt in matching fabric, and an attractive tie back. Can be worn with or without the belt. Machine wash in cold water. Available in sizes XS- 3X. The Sandy Dress is a "Tie Up" A- line dress with a 2 button back. This feminine piece is easy to wear and hard to wrinkle. Made of a lightweight poplin fabric, it is cool and classy. Cold Water wash. Available in sizes XS- 3X. If you would like to order this dress without the tie up bows, please indicate in the "notes" when placing your order. The Malia is a long sleeve shift dress. This versatile piece can be worn either for an elegant night out or as a casual piece. Made out of chiffon, you're sure to stay cool in this dress. Double layered. Available in sizes XS - 3X. The KAHIAU is a Quarter Sleeve Maxi Dress. Made of a Soft, Stretchy, Lightweight Cotton/ Spandex fabric. Dress it up with a fresh lei and wear it for a night out or to a luau! Available in sizes XS - 3X. Regular Fit. The FLORENCE Maxi Dress can be worn both as a casual piece or on a special occasion. Made of a Rayon/ Spandex blend, it is light weight and wrinkle free. Available in sizes XS- 3X and comes in regular length (54"), Short (51"), and Tall (57"). We recommend ordering 1 size up for a little looser fit. The KIKUE Hapi Coat is a loose fitting, long sleeve kimono style garment. Made of a shiny satin fabric, wear it with or without the tie. Great for a semi formal event, the satin fabric gives it an elegant look and feel. Machine washable and non fading. Available in sizes XS-3X. 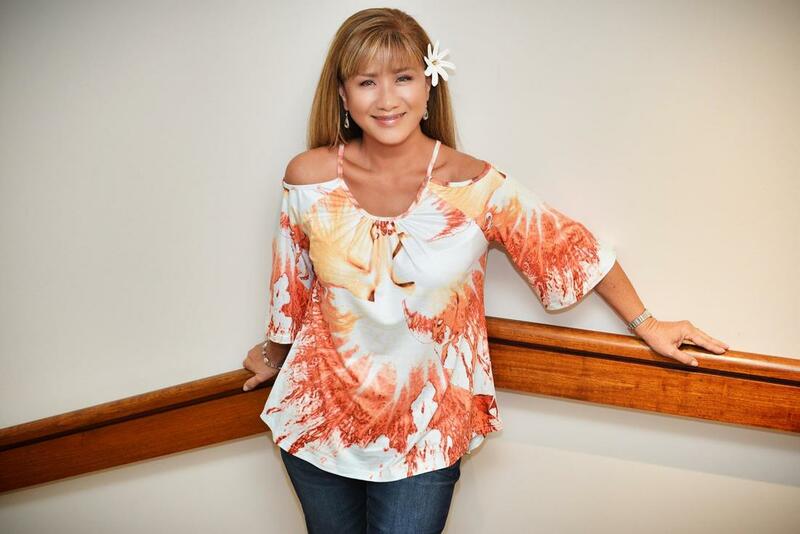 The KAHEALANI is an open front, Kimono Style top. Loose fit, 3/4 sleeve, made of lightweight chiffon. Add a splash of color to any black outfit, dress up any solid colored outfit, and add a touch of elegance to any solid colored outfit. Available in sizes XS - 3X. Slip on this elegant Drape Kimono for a night out. The Mikiyo is a stylish blend of Japan with an Island Flair. Choose your fabric; either a sheer chiffon or a silky knit poly/spandex blend. Available in 2 sizes that fit most - Small-Medium or Large-XLarge. Standard sizing. The Maria Blouse is a "bubble hem" sleeveless blouse. Made of Chiffon. This versatile blouse can be worn with a pair of shorts or jeans for a casual look or dress it up with a skirt or pair of slacks. Regular fit. Cold water wash. Available in sizes XS - 3XL. The Leilani Blouse is a Cut Out Side Drop Blouse. Comfortable, Airy, and Flattering. Made of Poly/Spandex fabric. Soft, stretchy, lightweight, and quick drying. This is the perfect blouse for travelling. Standard fit, however, we recommend ordering 1 size up. Available in sizes XS- 3X. You'll be sure to turn heads in The Shelly Dawn. This off the shoulder long sleeve top is made of 90% cotton/ 10% spandex. This top can be paired with jeans to go casual or dress it up with a pair of slacks. Regular form fitting. (order a size up if you want a looser fit) Slit on both sides, long slim bell sleeves. Available in sizes XS - 3X . Machine wash cold. Versatile enough to wear for an evening out or as a casual piece. This "puka" shoulder with flutter sleeves is made with a cotton/spandex blend that makes it lightweight, comfortable, and cool. Available in sizes XS ~ XXXL. Stylishly elegant, this "batwing" blouse can be worn with dress slacks, jeans or a skirt. Printed on a sheer chiffon with a poly/spandex lining. Available in sizes XS ~ XXXL. The Keri Skirt is a Midi Pencil Skirt, created to go with the Keri Blouse. Turn heads wherever you go in this stylish piece! Made of the same fabric as the Keri Blouse, a blend of Rayon/Spandex. Available in sizes XS ~ 3X. Step into these fabulous Palazzo Pants! Made of a Rayon/Spandex blend, they are light, airy, and comfortable. Available in sizes XS ~ XXXL; with short and tall options. WAIST: XS: 24"-25"; SM: 26"-27"; MED: 28"=29"; LG: 30"-31"; XL: 32"-34"; XXL: 35"-38"; XXXL: 39"-41"
HIPS: XS: 33"-34"; SM: 35"-36"; MED: 37"-38"; LG: 39"-41"; XL: 42"-45"; XXL: 46"-48"; XXXL: 49"-52"
Wear it for a night out on the town or just a casual evening out. This maxi skirt is cool and comfortable and slides right on. No zipper. This VERSATILE piece can be worn as a skirt with the matching blouse or pull it up and wear it as a strapless sun~dress! Made of Rayon and Spandex for a cool feel. Available in sizes XS ~ XXXL . If purchasing as a pull up dress, we recommend going one size up. Printed on a durable textured canvas, the NANEA COSMETIC CLUTCHS measure 12" long, 7" tall, 4" wide on the bottom. Hidden inside pocket. Comes with a Zipper Pull. Use it for everyday cosmetic storage, to take on your trips, or use it as a clutch for a night out. Machine or hand wash cold ; hang to dry. ​Pay with PayPal OR Debit / Credit Card. Upon Check Out, if paying with credit card, choose the option at the bottom, "PAY WITH DEBIT OR CREDIT CARD"